are in Boxing’s Hall of Fame. Bimstein teamed with IJSHOF honoree Ray Arcel from 1925 to 1934, forming the most successful training combo in boxing history. After World War II Bimstein enjoyed a successful partnership with trainer Freddie Brown. 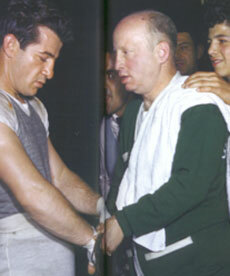 as a cornerman whose expertise with swabs, antiseptics and astringents between rounds was unsurpassed.